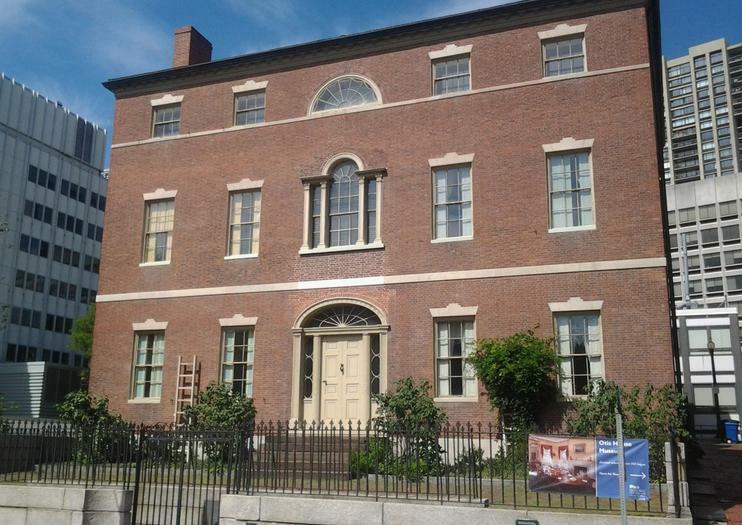 The Otis House Museum is actually a mansion, the last surviving one, in Bowdoin Square. This West End property was named for Harrison Gray Otis, a Federalist lawyer and politician. There are actually three Harris Gray Otis Houses in Boston, all of which were built by the noted architect Charles Bulfinch. The first, a National Historic Landmark, was built in 1796 and was inspired by a William Bingham house from Philadelphia. Owned by the Historic New England organization, this one now operates as a museum. The house is a look into the lavish lifestyle of Otis and his wife Sally. Otis made his fortune developing Beacon Hill, was a representative in Congress and then later became mayor of Boston. The home’s design is reflective of the Federal style, which Bulfinch introduced to Boston. Otis House is three stories, in five bays. The entrance seen today was added after 1801, which has a Palladian window above and a lunette above that. The third floor has ceilings that are just over six feet tall. The floor plan of the home is Colonial fashion, which the characteristic two rooms on either side of the central hallway. The home’s interior showcases many aspects of the Otis’ life, from the social and business aspects to understanding the role servants played in the home. The restoration was meticulous and required a lot of historical and scientific research. Udforsk Boston på egen hånd med det fleksible Go Boston-kort. Du kan tage på så meget eller så lidt sightseeing, som du har lyst til, i dit eget tempo, mens du sparer på feriebudgettet. Du får adgang til populære seværdigheder i Boston og rabat på shopping og spisesteder over hele byen. Nyd den direkte adgang til seværdigheder. Du skal bare downloade dit bevis på din mobilenhed og tage af sted - du behøver ikke indløse nogen kupon. Se mere af Boston til en lav pris ved at købe Boston Explorer Pass. Spar stort set faste priser, da du får adgang til dit valg af tre, fire eller fem seværdigheder i Boston, der vælger blandt de bedste byhøjpunkter som en Fenway Park Tour, USS Constitution Cruise, Freedom Trail Walking Tour og meget mere. En inkluderet guidebog hjælper med at designe den perfekte rejseplan.